This seismic profile (N-S) is representative of the area where it was shot. It is perpendicular to the structural trend. Therefore, one can say that sediments were shortened and uplifted. So, the maximum effective stress, 1, was horizontal and striking N-S. 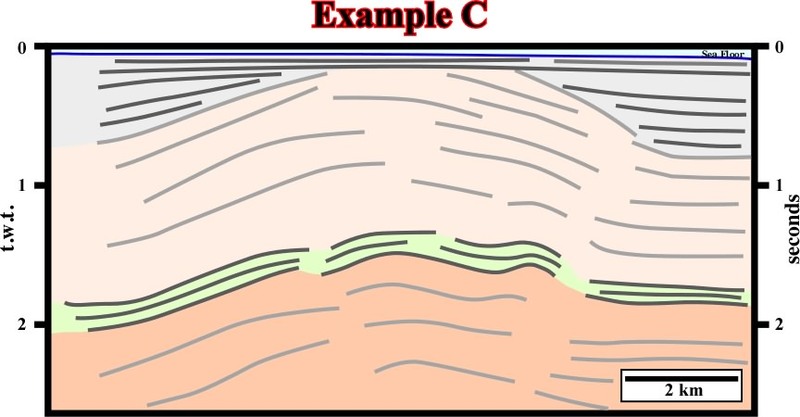 In other words, in the area, the predominant structures are (i) cylindrical folds, (ii) folds associated with tectonic inversions and (ii) thrust or reverse faults. 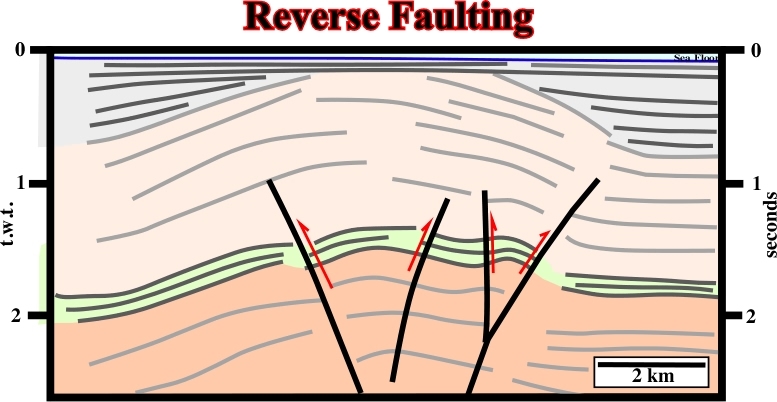 It is relevant to point out that in a reverse fault the shortened faulted block is almost always the up-thrown block, as illustrated (reverse fault around 2 seconds, in the left part of the line). On the other hand, taking into account the different thickness of the faulted blocks (upthrown block is thicker) it is not reluctant to hypothesize the large anticline structure is associated with a tectonic inversion of a pre-existent normal fault. Seismic lines are roughly time profiles. So, when interpreted, in geological terms, interpreters should not forget that Geology is scale dependent. In other words, interpreters must take into account not only the horizontal and vertical scales but lateral velocity changes as well. 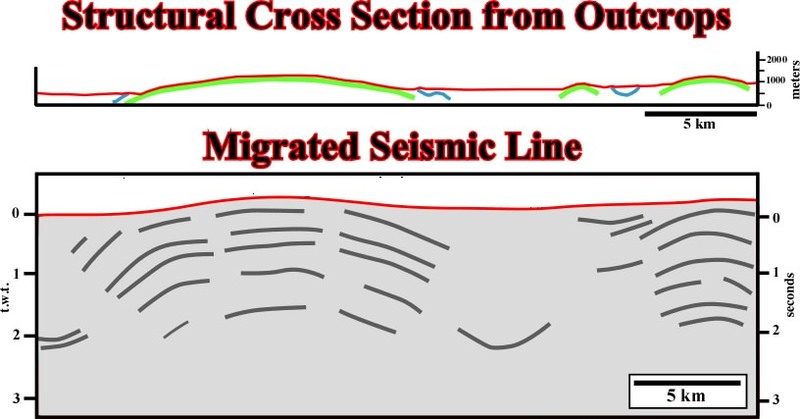 In addition, when working with unmigrated seismic data, as seismic horizons (chronostratigraphic lines) are not in its real position, the geometry and internal configuration of seismic interval must be carefully determined. When migrated seismic lines were not available, this method was quite usefull. Presently, as the large majority of the seismic lines are migrated, it becames obselet. On this seismic line the shortening is evident. All faults have a reverse geometry, i.e. inversion and reactivation was strongly enough to change the fault geometry. On this seismic line from the Tanganyika Lake, one cannot say if it corresponds to a transfer basin or to a normal graben. Such a differentiation requires to known how the faults strike in relation to 2. A major tectonically enhanced unconformity separates two tectonic realms. The older one was compressional. The salt layer and its cover were strongly shortened and uplifted creating a major erosional surface, which underlies a significant stratigraphic cycle boundary. In this particular line, it is difficult to see is the basement is or not involved on deformation. Notice that on seismic lines the bottom of the salt layer usually shows a velocity anomaly (pull-up). On this the evolution of the flanks of the dome is different. They are quite asymmetric, particularly the rim synclines. Note that as the line is unmigrated, interpreters have a tendency to increase the wideness of the dome (red picking instead green picking). On the other hand, firstly, it is quite evident that the dome cannot have vertical flanks (mechanical instability), secondly, taking into account the velocity of the seismic waves in the salt, a continuous column (3 seconds, t.w.t.) of salt corresponds roughly to 6-7 km of salt, which seems unlikely. 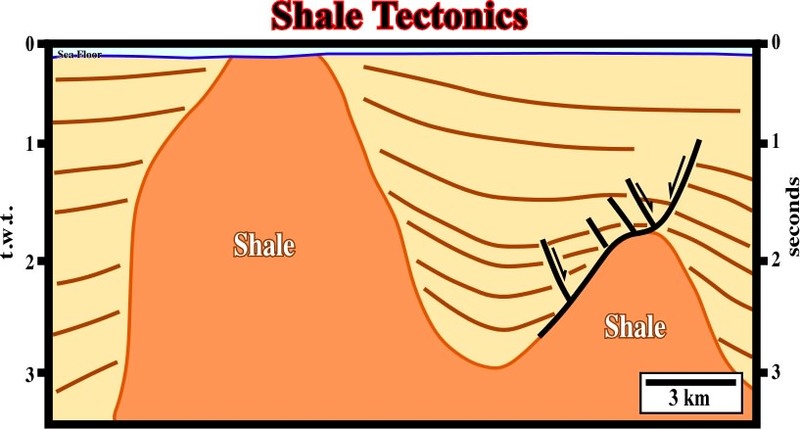 Without regional context and in isolation, very often it is quite difficult to decide if a detachment plane is associated with a salt or shale interval. This is particularly true when the bottom of the mobile substratum is not well individualized. 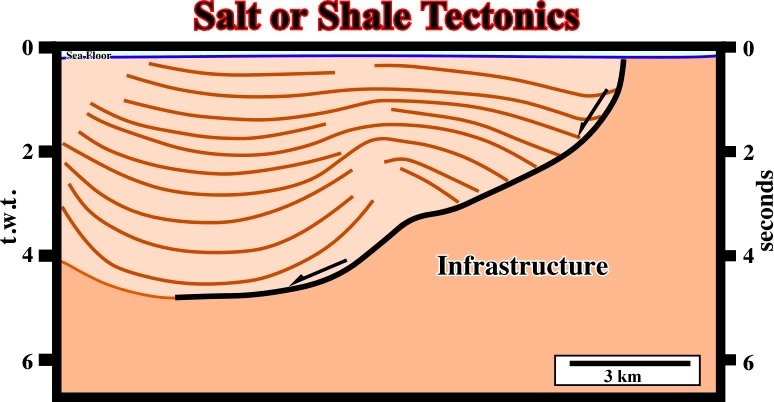 This seismic line shows a typical association between shale and salt movements. 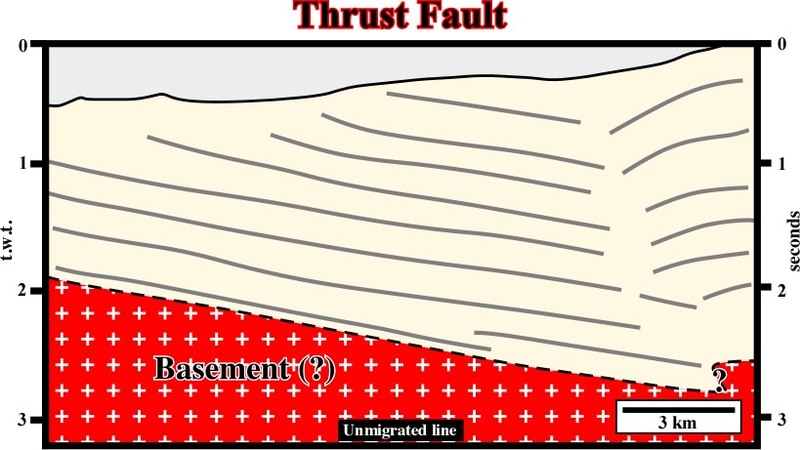 On this seismic line, it is easily to recognize that the majority of the faults are pre-compaction. Indeed, the dip of those fault planes chances with the compactability of the intervals. 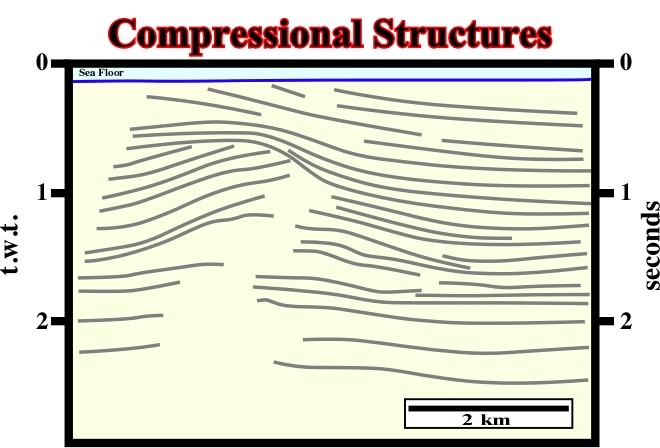 i.e., plus compactable is the sedimentary interval lower is the dip of the fault plane. 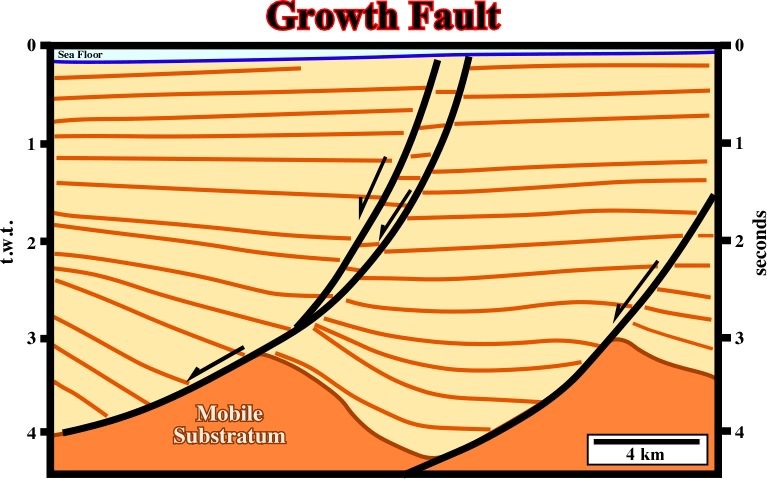 When a fault is active during deposition, it means that the downthrown block, rotates, and the fault plane becomes less and less steep with depth, due to a volume problem. 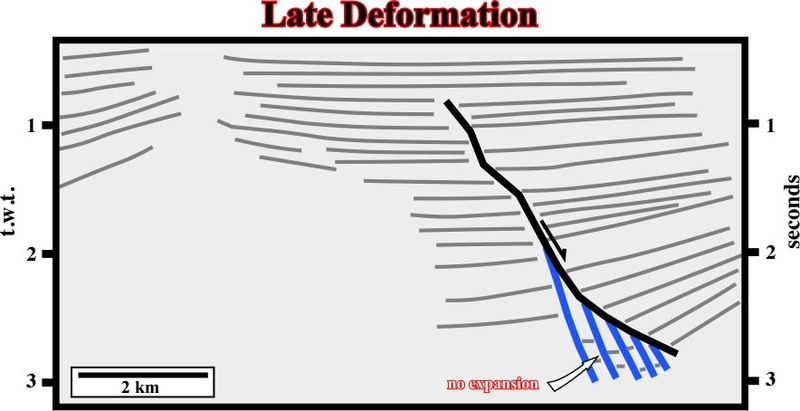 The dip of a pre-compaction fault changes with the lithology. Higher is the dip of the fault less compactable is the juxtaposed sedimentary interval on the footwall (upthrown block). 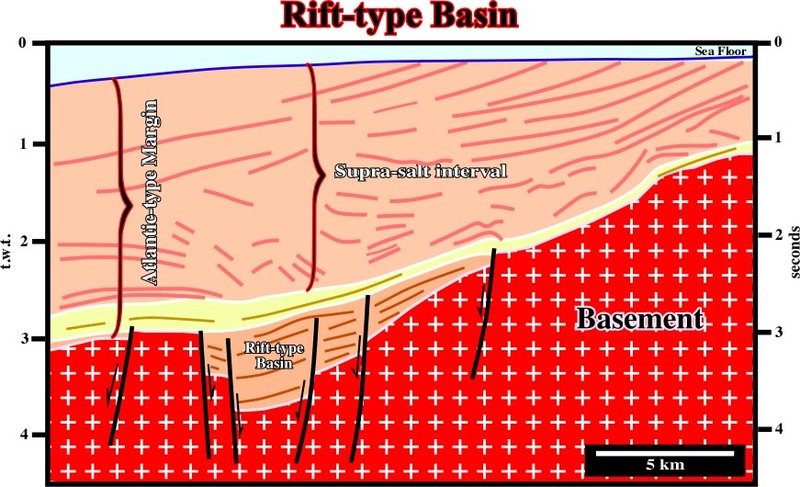 On this line, the fault in red is precompaction as suggested by the changes in the dip of the fault with the lithology. On contrary, the faults in blue are posterior. 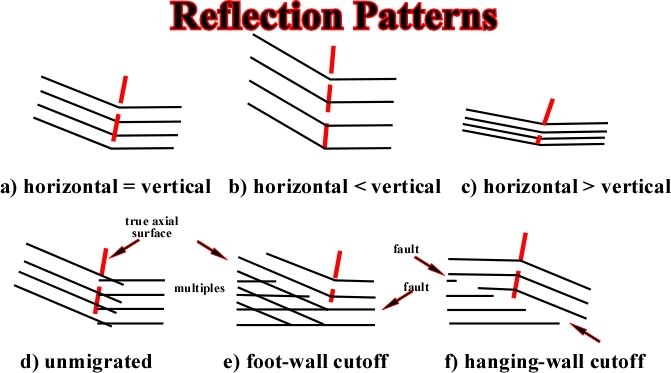 They do not correspond to really normal extensional faults, but to plane discontinuities between rotated blocks (splintering or "horsetail" of the fault).